Source du titre propre: Title written on the document. File contains "A Brief Survey of The History of The Capreol Public School" written by C.R. Judd, principal of Capreol Public School from 1926 to 1964. The 'brief survey' includes a handwritten timeline of events, a chronological list of the school teachers, a chronological list of school board members and trustees and a copy of a typed, annotated letter from Judd to Inspector of Public Schools L.L. 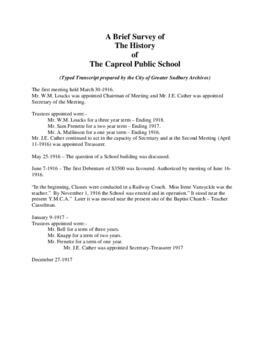 Skuce regarding the history of Capreol Public School. Photocopy of item is held at the Northern Ontario Railroad Museum and Heritage Centre. To learn more about the railroad museum, visit http://normhc.ca/. Item is available in pdf format. C.R. Judd used information gathered to create this document to write a speech for Capreol Mayor James Coyne to deliver to King George VI and Queen Elizabeth during their Royal Visit on June 5, 1939. James Coyne (1894-1981) was the mayor of Capreol for 7 years. To learn more about Coyne, see the following webpage written by his daughter Rita Christensen on Capreolonline at http://capreolonline.com/Looking/People/coyne/jcoyne.html.